Has anyone had problems with the starter not engaging, but turning, when you press the starter button? 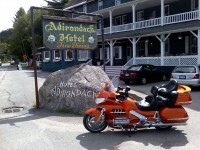 It is a 2009 GL1800 with 26,600 miles on it. It is always garaged unless I'm on a trip, then it is usually covered and I do not use a pressure washer on the bike. After the bike sits for a few days with out any use, when I try to start it the first time it sounds like (comparing it to the old car starters) the drive is not engaging, just spins. The starter sounds like it is turning but the engine is not. When I try it the second time it starts fine. Have had this happen on four different occasions so far. Asked the dealer and they said if they tear into it and find nothing wrong, Honda will not pay for it. Of course when I took it to the dealer, it started fine. I do have the extended warranty until 2016. Does it happen more if the bike has sat for a period of time? i.e. if you let it sit for a couple days will it happen, but it won't happen if the bike has been started within the past few hours? Yes it only has happened after sitting for a few days and only on the first attempt to start it. After first time started it will start like normal. I think this winter I will have to check the battery to make sure it is up to snuff. The connections are clean and tight. I have some things I want to add this winter so it will give me a chance to check everything out. I had not thought much about the battery possibly could be bad as I keep it on a battery tender when not riding for long periods. Just another chance to hone my skills as a diagnostic mechanic. Thanks for everyone that responded. Now where is that warm spring weather? April is so far away. I admit, I know very little about the GL1800 engine, and know more about the '76 CB750 I have. I'm not sure that the Honda engines use starters with a "Bendix" type starter, but probably use a "sprague"(sp) clutch starter. If you ever heard your car starter, they have the distinctive "CLACK-whir-whir-whir" sound when cranking (even the Harleys too), and those are "bendix" starters. The Honda lacks all the sound effects and the starter motor smoothly engages the engine using a one-way clutch, the "sprague" clutch. These are tiny rollers that are backed with a spring, and when the starter rotates the cage they're in, they spin the engine to start. If the oil is too thick, the rollers have a hard time getting wedged in the cage to spin the crank, and the whole thing just whirs away and no cranking. Occasionally, they (the small rollers) may start to clatter as they start to "catch" and dislodge. If this happens, where you hear a rattling sound when you press the starter, it's only a matter of time before you're replacing all the starter sprague clutch bits and pieces. Oh, and another thing. If your dealer is gun-shy about starting into a repair that's not needed, at least tell them about it every time it happens, and have them document and give you a copy of the complaint. That way, when it DOES break after the warranty is up, you can show them and say "Told ya so....". Steve F wrote: I'm not sure that the Honda engines use starters with a "Bendix" type starter, but probably use a "sprague"(sp) clutch starter. Looking at my service manual, I find that you are correct. The Goldwing uses a sprag clutch as opposed to a bendix, and therefore this makes the problem more mystifying. The sprag resides inside the engine rear cover where it should receive lubrication from the engine oil. It should not stick with the constant washing it gets when the engine is running and the oil is hot. This to me could become a problem and as such, I totally agree that the dealership should document every occurrence. I am going to start this procedure with my dealership, even if it pisses them off. If you looked at the link that I had in my post, they mentioned the buildup of contaminants and deposits from the oil that has been known to make the sprag clutch not function. They said that some have used "diesel engine oil" to remove these deposits. Maybe you can give it a try? Steve F wrote: I admit, I know very little about the GL1800 engine, and know more about the '76 CB750 I have. I'm not sure that the Honda engines use starters with a "Bendix" type starter, but probably use a "sprague"(sp) clutch starter. If you ever heard your car starter, they have the distinctive "CLACK-whir-whir-whir" sound when cranking (even the Harleys too), and those are "bendix" starters. The Honda lacks all the sound effects and the starter motor smoothly engages the engine using a one-way clutch, the "sprague" clutch. These are tiny rollers that are backed with a spring, and when the starter rotates the cage they're in, they spin the engine to start. If the oil is too thick, the rollers have a hard time getting wedged in the cage to spin the crank, and the whole thing just whirs away and no cranking. Occasionally, they (the small rollers) may start to clatter as they start to "catch" and dislodge. If this happens, where you hear a rattling sound when you press the starter, it's only a matter of time before you're replacing all the starter sprague clutch bits and pieces. I did look up the starter motor and found that it is like a type of clutch you mentioned. This seems to happen at any temperature, not just cold temperature. I am keeping in contact with my Honda shop on this as I don't want to be caught with a repair bill when the bike goes out of warranty. I use Amsoil 10W40 motorcycle oil and have never had any trouble with any of my former cycles, a 98 Honda 1100 Shadow and a 2001 GL1800. Have put around 70,000 miles on these and my current bike,using Amsoil, with no trouble until now. This started to happen late summer of this year somewhere around 23,000 miles. Steve F wrote: If you looked at the link that I had in my post, they mentioned the buildup of contaminants and deposits from the oil that has been known to make the sprag clutch not function. They said that some have used "diesel engine oil" to remove these deposits. Maybe you can give it a try? Like 2008retiredplb, I am using 10W40 Synthetic Motorcycle oil, which is highly detergent. I would not think diesel engine oil would be better, but Amsoil also has a crankcase cleaner that I am going to put in before my next oil change. 2008retiredplb wrote: This started to happen late summer of this year somewhere around 23,000 miles. I have only 23,000 Kms on my bike which is between 14 and 15 thousand miles. This also started this past fall for me. I do wonder if the synthetic oil is in any way to blame for this, but for the life of me, I cannot see how this could be possible. Perhaps because the synthetic adheres to metal parts better than dino oil does??? what is the year and model of your bike? I used Amsoil in my 2001 GL1800 for about 60K of the 107K miles with no problem. Then all 27K with the exception of the original factory oil in the 2009 GL1800 without any trouble until maybe the last 1000 miles, so I don't think it would be anything to do with the Synthetic Amsoil. I have emailed Stu Oltman, Wing World Senior Technical Editor, who does the workbench articles and is very knowledgeable on Gold Wings and asked him if her knew of any problems with this issue. With the condition of the oil I drain and the frequency of the changes, I do not see how it could have any build up of sludge or anything detrimental to the starter. The oil coming out after 5000 miles is almost as clean as some new oils I have used in past vehicles. If I can't get answers about this I will send a sample of the drained oil to be tested and see if anything is found. One thing the synthetic oils are noted for is not leaving sludge in the engine, and cleaning an old engine as you use it. 2008retiredplb wrote: what is the year and model of your bike? Same as yours... 2009. It is an Airbag model, tho. I bought it brand new, still in crate, Fall of 2010. I do not mean that the synthetic is getting dirty. What i meant is perhaps it is adhering too much to the rollers in the sprag, and not allowing them to rotate as they should because they are too slippery roller to cage of the sprag clutch. Amsoil has run into problems with this before. It is what makes them so good with the wear tests. If metal cannot contact metal, there is no wear, but if the rollers do not turn, the sprag will not ramp up. I have a query in to Amsoil's technical department. I will post the results here, as I hope you will post Stew Oltman's. easy test, change oil brand for one service. Two bikes with same fault and same oil, whats to lose? I just got a reply from Amsoil Technical services as shown below. AMSOIL Motorcycle Oils meet the frictional characteristics (JASO MA/MA2) that are required by your bike and should not be the cause of these issues. What types of temperatures are you riding in? One problem you may be having is too heavy viscosity oil that is not flowing enough, thus not allowing your clutch to engage. If you are riding in the low 60s or lower, I would suggest switching to 10W-30 Motorcycle Oil. Please get back to me with further details. themainviking wrote: I just got a reply from Amsoil Technical services as shown below. SAE 10W-40 Synthetic Motorcycle Oil in GALLON containers and I'm using the Honda OEM filter. The starter problem happens at any temperature between 90 deg. and 40 deg. So I do not think it is the viscosity of the oil making the problem. I think it is in the starter itself. Also if you look at my previous posts you will see I had a 2001 GL1800 that was run for 60K of its 107K miles with the same oil, and it never had a problem with the starter. I think it is something with the 2009 or the starter itself. I posted this to see if anyone else has been having problems and so far, you seem to be the only other one experiencing it. I am still waiting for a response from Stu Oltman of Wing World Magazine and will post his response when I get it. If I don't get some answers here I may need to wait and see if it gets worse or quits working completely. Hopefully it will be covered under warranty, good until 2016. I wish others, if they have had the problem, would post. to see if it is only the 2009 model or something else. I do know of a friend that had his 2007 Gl1800 starter go bad and needed to be replace. That is uncommon with the GL1800. I may see him tonight, and will ask him what happened, if he is at our chapter meeting. Let me help you with your starter problem. I have seen this problem many times with goldwings. You probably won't believe what the problem is but you will be amazed when you try it. Your starter clutch is metal and bathes in engine oil. When the engine oil becomes contaminated with condensation, the clutch will not engage. Also if your engine oil is dirty. Another common problem is engine oil that is too thick. Don't use 20-50 wt. I bet your clutch never slips when the oil is hot and thin! Change your engine oil and I guarantee your problem will go away. good luck and let me know how you make out. okstay wrote: Let me help you with your starter problem. I have seen this problem many times with goldwings. You probably won't believe what the problem is but you will be amazed when you try it. Your starter clutch is metal and bathes in engine oil. When the engine oil becomes contaminated with condensation, the clutch will not engage. Also if your engine oil is dirty. Another common problem is engine oil that is too thick. Don't use 20-50 wt. I bet your clutch never slips when the oil is hot and thin! Change your engine oil and I guarantee your problem will go away. good luck and let me know how you make out. I am fully aware of the problems with dirty oil. I keep my oil & filter changes on a 5,000 mile but no longer than 6,000 mile interval. 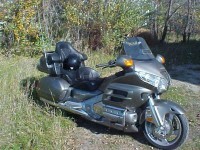 It gets changed once durning the riding season and again prior to storage for the winter. So the problem is not with contaminated oil. I did look at the owners manual and it recomends 10W-30 oil. but if you check the recomended oil chart it also shows 10W-40 as approved oil. Even so I have had this problem at many different tempatures, from 90 deg down to 30 deg. I hope this chart above will show up, as it gives the tempature range for recomended oils. I run well within the range of the 10W-40 oil. But if the shop and Honda (it is at the shop now) cannot find a problem with the starter, I may try 10W-30 oil and see if it makes any difference. I think you misunderstood my post. It is usually not dirty oil that causes the problem, it is water or better known as condensation. Changing your oil is the quickest way to get rid of it. If you want to test my theory, run your bike until it reaches running temperature then let it idle until the cooling fans cycle on and off a few times. This will ensure the engine is hot enough to "boil off" the water in your oil. The largest contributor to condensation in the oil is short runs or running your engine without fully warming it up enough to boil off the water. Everytime you start your engine when it is cold, condensation forms in your oil. It doesn't matter what the outside temp is. Although the colder it is outside, the more condensation will form in your oil. After you thoroughly heat up your engine and boil off the water, I think your starter clutch will operate just fine. Good luck and let me know how you make out. I really believe there is nothing wrong with your starter clutch. Again, I have seen this problem many times with goldwings. One hint you gave me was you change your oil every 5000 miles. From my experience over the years with Hondas, this is way too long. Try shortening it to 3000. I have talked to the mechanics at my Honda shop and they are checking into the problem at this time. If they or the Honda rep can't find a problem or something that is causing this, then I will try changing the oil to 10W-30 Amsoil and see if that helps. 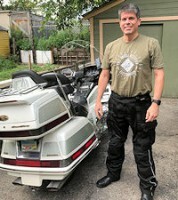 I have used the Amsoil 10W-40 in both my Goldwings (2001 & 2009) running over 80,000 miles with no problems until late this year. During the storage I never start the bike until it comes out for the next riding season. Through this problem, during the time in storage or when idle for a few days, I have just checked the starter to see if it would repeat the problem without actually starting the bike. It has done it a number of times where the first time I try to start it, the starter just spins but does not turn the engine and the second time I try it turns the engine like normal. It is not a weak sounding spin, just will not engauge the engine. If it was the type of starter that we used to have on cars, with a bendex starter, it sounds the same as when the bendex was stuck and not engauge the flywheel. Also I keep the battery on a battery tender when in storage so I don't think it is a problem with the battery or connections and not a problem with the starter switch. I also have a request of Stu Oltman of "Workbench" at Wing World but have not gotten a response yet. If he can't give some answers, then I may have to continue until the starter quits completely. Thankfully I have warranty until 2016 so it should be covered. But I will keep reporting the problem and have it documented every time it happens. That way if it doesn't get fixed while on warranty, I have a chance of getting it fixed by Honda, under warranty after it expires. Thanks for keeping me updated on your starter problem. Let me add one more thing. In the many years I have worked on motorcycles, I have seen this problem many times. It is possible you have lazy springs that push the rollers to engage the starter. Before you go through a tear down, try running an engine flush chemical through your engine. Your dealer will probably do this also. Sometimes when I have torn them down, I would find a "butter like" sludge buildup on the starter clutch rollers and springs. Once this was cleaned, the starter clutch worked fine. After seeing that, I would always run a can of engine flush through the bike first with good results. Keep in mind, if your starter clutch is operating when the bike is warm, it is probably ok. You may have a mechanical problem, but before you let anyone tear her down try flushing out you engine. You may be pleasantly surprised! One more thing. I have seen this problem more often on bikes that run diesel oil. I don't know what the connection might be. 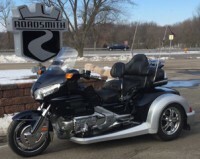 I do know that any oil additives that claim to be "slippery" are not good in a goldwing. Good luck and keep us informed. And again, I feel 5K is too long on an oil change. Remember, your oil lubes your trans also.